Mystery Lovers' Kitchen: Welcome author @HannahDennison with book #giveaway!! Welcome author @HannahDennison with book #giveaway!! Please welcome our guest, Hannah Dennison. Hannah is the author of The Vicky Hill Mysteries (Little, Brown) and the Honeychurch Hall Mysteries (Minotaur), both set in the wilds of the Devonshire countryside. Hannah originally moved to Los Angeles to pursue screenwriting. She has been an obituary reporter, antique dealer, private jet flight attendant and Hollywood story analyst. 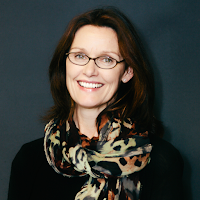 Now living in Portland, Oregon, Hannah still continues to teach mystery writing workshops at the UCLA Extension Writers’ Program in Los Angeles, California. Hannah has served on numerous judging committees for Mystery Writers of America and is serving on the MWA board for 2016-2018. Although she spends most of her time in Oregon with her husband and two insane Vizsla dogs, Hannah’s heart remains in England. 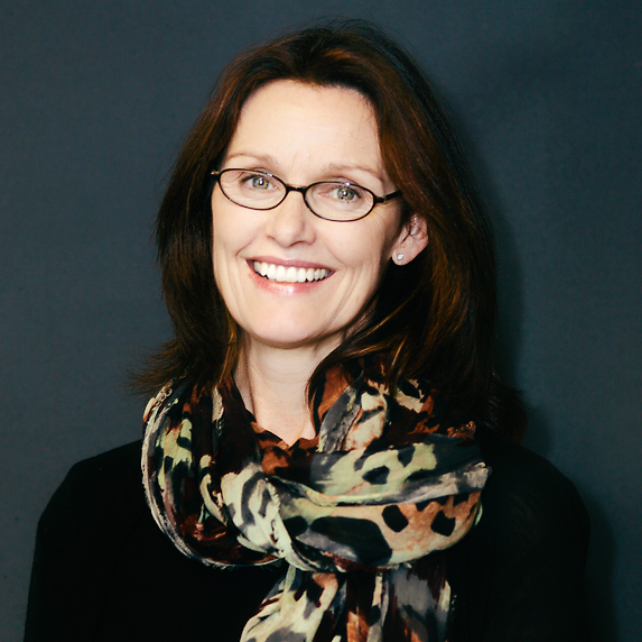 She is a passionate supporter of the Society for the Protection of Ancient Buildings, the Historic Houses Association, and the National Trust. She enjoys all country pursuits, movies, theater and seriously good chocolate. Don't miss Hannah's book(s) giveaway below!! How to make a traditional English Cottage Pie! When I was a child in the early sixties, my mother’s variation on our weekly menu rarely changed. On Sunday we had a roast (beef, lamb or pork); Monday was either Cottage or Shepherd’s Pie (depending on what joint**was leftover on Sunday); Tuesday was bangers and mash; Wednesday was a stew of some kind; Thursday was the dreaded fried liver and onions; Friday was fish and chips and Saturday was soup and cold cuts or eggs. **Joint is British slang for a particular cut of meat—usually “topside”—and not to be confused with cigarettes of the recreational kind. At that time, pasta was only just making an appearance in England but my father was leery of “foreign goop” as he called it, so pasta did not feature in our household until I was a teenager. As the Dennison’s weekly menu illustrates, it was not particularly varied and definitely the kind of culinary fare that gave British cooking the bad reputation that it wholly deserved back in the last century. But I really did enjoy eating Monday’s Cottage Pie. As you can probably gather, it was a popular way of eking out a Sunday roast by using the leftover meat and the gravy. It honestly makes a huge difference if you can make this dish from scratch— which is what I did especially for Mystery Lovers’ Kitchen (fanfare of trumpets please!). And yes, I agree, who has time to do that these days! 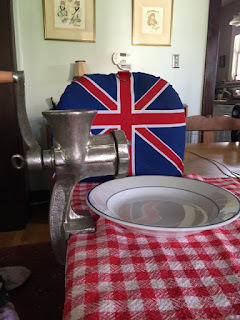 If you are making it from scratch you’ll need some kind of meat-grinding contraption. Pictured is the one my mother gave me­ decades ago. See how shiny it is? I am embarrassed to admit that up until now, I’ve only used it three times. A quick note: This is not a Bolognese sauce with mash on top so be brave. Don’t use tinned tomatoes. Ever. But by all means add lashings of tomato ketchup as a condiment on the side. Grind up the leftover beef. Heat the oil in a large skillet. 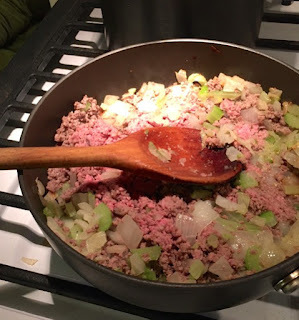 Add the freshly ground beef, chopped onion, celery and crushed garlic. Cook until slightly brown. Gently fry the ground beef in it’s own fat in a large skillet until brown. Remove meat with a slotted spoon and set aside. If there are more than a couple of tablespoons of fat left, drain off the rest and discard. In the remaining fat, gently fry the chopped onion, celery and crushed garlic until soft. I don’t add oil when frying ground beef because the end result can be very fatty. You’ve now got your browned beef, onion, celery, and crushed garlic in the skillet. Pour in one cup of leftover gravy, half a glass of red wine (optional), 2tsp Worcestershire sauce and dried thyme, salt and pepper. Simmer for ½ an hour, adding a touch of water if you think it’s too dry but don’t make it too runny or the mashed potato will sink. If you think it’s too watery, add a touch of cornstarch. Meanwhile, peel and cut the potatoes into chunks. Boil them until you can stick them through with a knife. 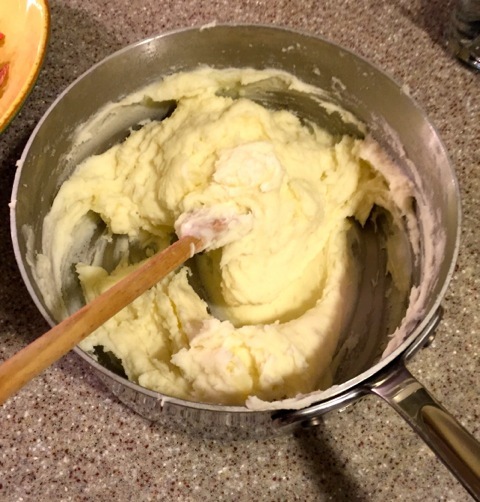 Drain the water and mash them up with butter and sour cream until they are fluffy. Put the meat sauce in a deep pie dish. I use a soufflé dish. Pop the mashed potato on top of the sauce. Dab it with butter and run a fork across to help the potato crisp up. Stick in the oven for 40 minutes until brown and crisp on top and you can just see the sauce beneath sizzling. 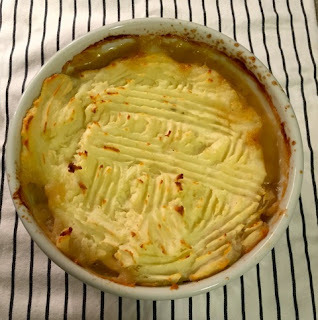 A final note, Cottage Pie freezes well. And now for that giveaway! 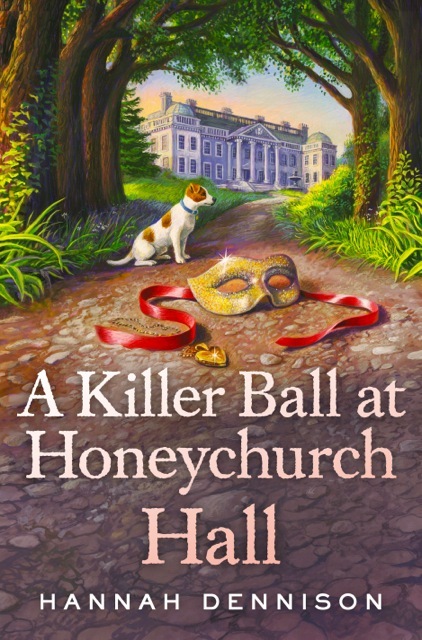 I am giving away 1 hardback copy of KILLER BALL AT HONEYCHURCH HALL plus 1 paperback copy of MURDER AT HONEYCHURCH HALL to 2 winners. Leave a comment telling me whether you've ever eaten anything British in nature and remember to leave your email (cryptic or else-wise) so I can contact you if you win. Cheers! wing at Honeychurch Hall, suspicion falls on those who had been living there half a century ago. In those days the Bushman Traveling Fair and Boxing Emporium camped on the estate grounds, so Kat is not surprised to learn that her mother Iris knew the victim. Meanwhile, the unexpected appearance of retired sailor and local lothario Bryan Laney sets female hearts aflutter. Despite the passing years, time has not dampened his ardor for Iris but the feeling is not reciprocated. With stories of hidden treasure and secret chambers, misguided loyalties and spiteful deception, past and present collide. As Kat becomes embroiled once more in her mother’s tumultuous bygone days, she comes to realize that life is never black and white, and that sometimes, lies become necessary to protect the ones you love. Lived in London for a while, and have an English son-in-law, so I've eaten lots of English food. Mark specializes in curries, but I love to make cottage pie and sticky toffee pudding.